Appealing comfortably furnished apartment in. 1 Floor . The apartment is designed for only 2 persons. Not geared for children. The apartment area is 68 sqm. With a living room, bedroom, kitchen, bathroom and closet. The kitchen is equipped with high quality electrical appliances, as well as electric cooker with ceramic hob and oven, refrigerator, dishwasher, microwave, toaster and all necessary small electrical appliances. In addition, a CD player. The living room is additionally equipped with satellite TV, Stereroanlage and free W-Lan connection. Smoking in the house and in the apartment is out of consideration for other tourists not allowed. Sheets and towels are not! The final cleaning is additional 30 €! The tax to the city, (tourist tax) in the preseason 1.05 € p. P. and night, and in the high season 1.20 € p. P and night. This tax is passed on by the landlord to the city. A lockable room for bicycles is available. The parking space for the car is located on the property. The property is secured by an electric gate. The terrace in front of the cabin is for the tourists. Barbecues and garden use is of course allowed. Pets not allowed !!! As a starting point to explore the Vorpommerschen Bodden landscape, as well as city tours, hiking in the Darßer forest, beach days and long bike rides in the region and beyond. Eine bestens ausgestattete Ferienwohnung in der es an nichts fehlt; dazu noch freundliche und perfekte Gastgeber. Der ideale Standort für Fahrten, Wanderungen oder einfach nur erholen. Das Ehepaar Krist ist sehr freundlich und lieb.Man fühlt sich dort sehr wohl.. Sehr zu empfehlen. Wir haben 2 Wochen in dieser Ferienwohnung verbracht. Schon kurz nach der Ankunft waren wir sicher, dass es die am besten ausgestattete Ferienwohnung ist, die wir bisher besuchten. Jede Menge Platz zum Verstauen und trotzdem noch genügend Platz zum Verweilen. An Küchenuntensilien fehlt einfach nichts. Die Vermieter sind sehr sehr freundlich und hilfsbereit, ohne jedoch aufdringlich zu sein. 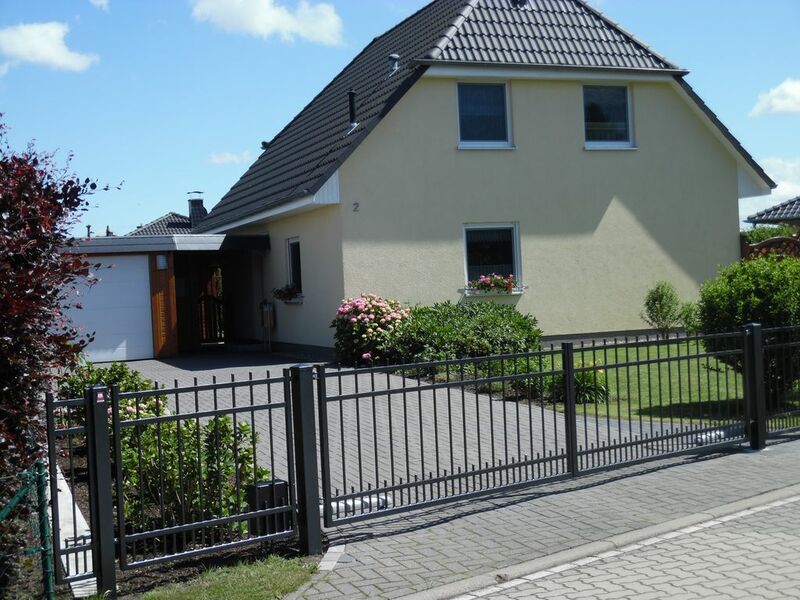 Wir können diese Ferienwohnung nur empfehlen und kommen gerne wieder! Es passt alles! Alles andere als 5 Sterne wäre gelogen. Wir haben unseren Urlaub in Barth bei Familie Krist in vollen Zügen genossen. Mit Sicherheit werden wir wiederkommen. Die Wohnung ist so wie beschrieben, einfach super. Sehr gut eingerichtete Wohnung, sehr sauber und geräumig. Privates Umfeld, sehr nette Vermieter. Sie hatten immer einen Tipp, sei es zum radeln, einkaufen oder Restaurant. Barth, a city with a medieval town center and about 8,000 inhabitants is located in the Vorpommersche Bodden landscape directly on the Barther Bodden. A unique landscape that imposes itself on hiking and cycling. At the gates of Barth are the Zingst, the Darß and Fischland with their unique Baltic Sea beaches, the piers and forest areas that can be explored on designated trails, on foot or by bicycle. The kilometer-long sandy beach is ideal for holidays. A holiday area which speaks of rare natural beauty, peace and relaxation for themselves. Our house is located in a very quiet residential development (dead end). The apartment is located in the 1. Floor and has a floor area of ​​68 sqm. It is designed for 2 people and completely furnished according to modern standards. Bicycles can be accommodated in a separate, lockable hut. The terrace in front of the log cabin is specially designed for the vacationers. A parking space for the car is available on the closed property. Bettwäsche und Handtücher sind mitzubringen, falls gewünscht Aufpreis 10Euro.